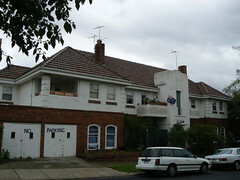 McTavish Apartments were built in 1941 on the site of the home of the Lyman family, Thornhill Mansion. 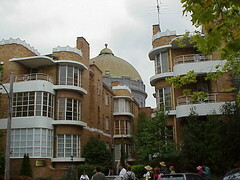 They were designed by architect Charles Grenier. 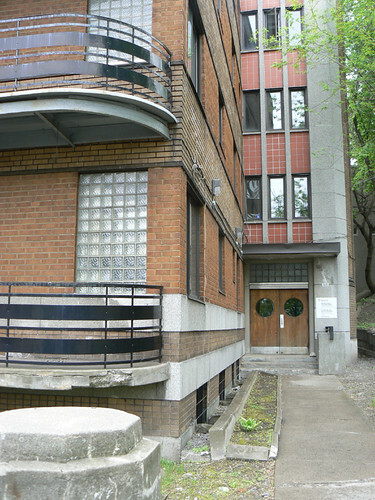 The building is now part of Montreal's McGill University and is used for academic rather than residential purposes. 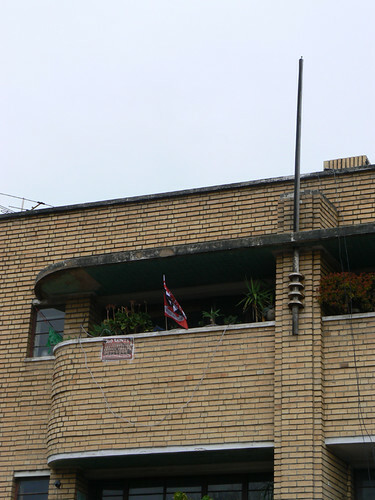 The apartments feature maritime elements such as metal-railed balconies and porthole windows with embedded square panels which for ventilation. 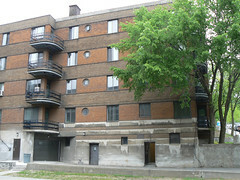 Along the McTavish Street facade the windows facing onto the balconies use glass bricks, presumably for privacy and the setback entrance also has porthole windows with glass bricks above the door. 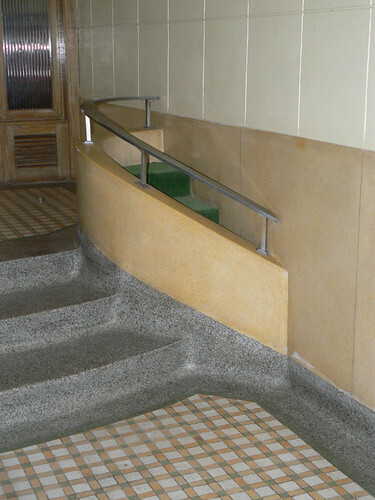 Inside there is a small foyer with a green and yellow gingham pattern on the floor and a pair of fantastic handrails either side of a short flight of steps leading to the central core of the building. The main stairs for the building wind around this semi-circular stairwell. 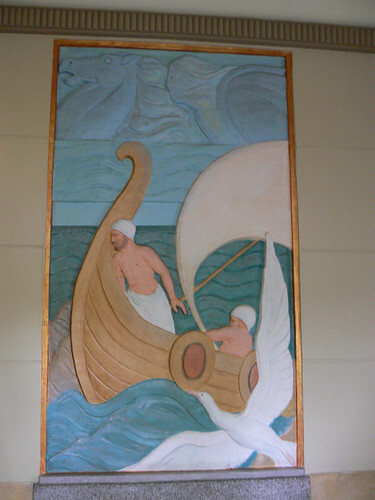 The maritime theme reoccurs in the colourful relief on the wall in the foyer. This wonderful sight greets you as you first walk into the building. Ancient mariners accompanied by an albratros or other large seabird looked over by a horse-borne goddess. A superb design. 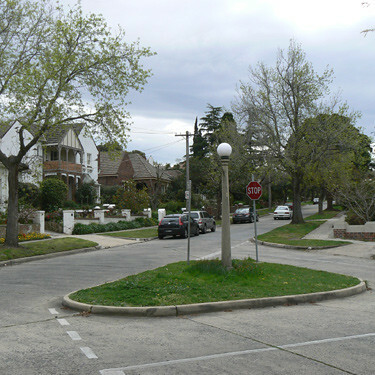 The Golf Links Estate in Camberwell is a wonderful collection of interwar houses but when I visited a week or so ago I was taken by the these small traffic islands. I saw two and as you can see they are triangular in shape with a round light on a concrete support in the middle of the island. 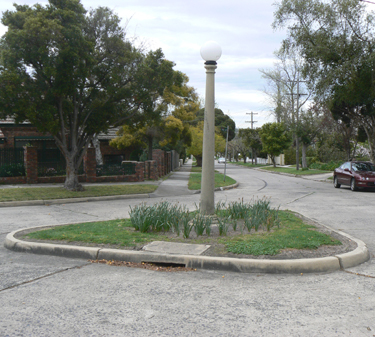 The streets in the estate are quite narrow by today's standards and it is good to see that the traffic islands have survived where surely there would have been pressure to shrink them to aid the flow of cars through the intersection. 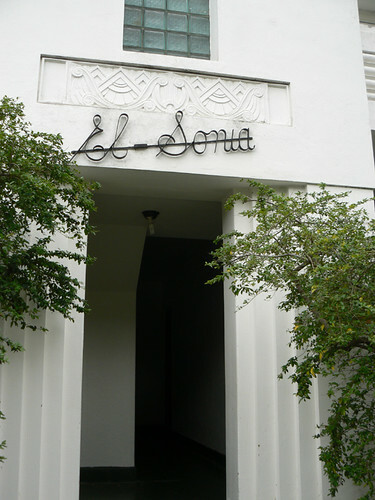 El Sonia in St Kilda East is wonderful mish-mash of deco styles. 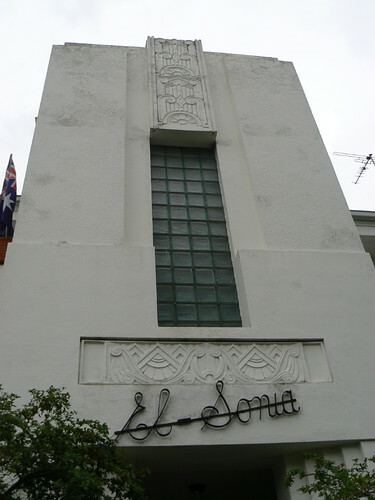 A central entrance tower with glass bricks, two Art Deco decorative panels, El Sonia spelt out in cursive metal work and flanked by two small rounded balconies. Two original garages with wooden doors and small windows and maybe with the move to a greener world cars might fit through those narrow openings once more. 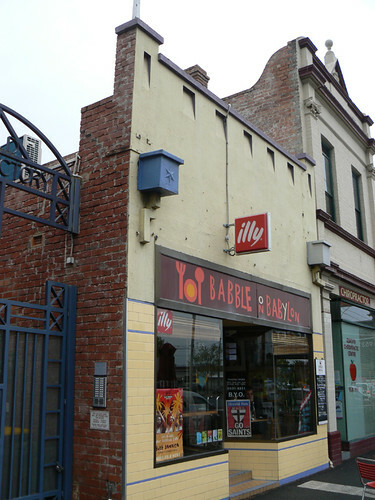 Then there is that almost clumsy square open balcony above one of the garages not to mention the conventional (but practical for Melbourne's weather) pitched tile roof. 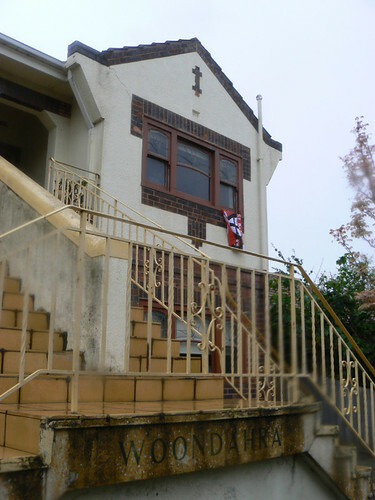 If you look carefully on the nearest rounded balcony you'll see, alongside the Australian flag, a Geelong FC flag. Deep in enemy territory, so to speak, but Australian Rules Football, in general, is not like that. 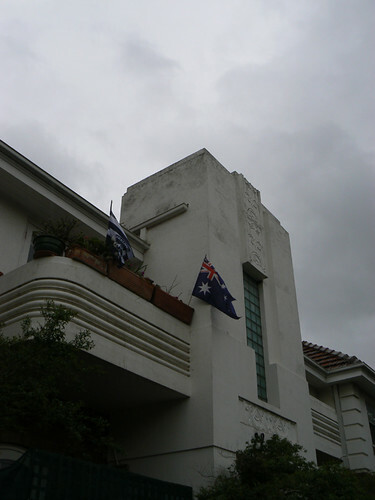 Congratulations to Geelong in the Grand Final yesterday. They have been an awesome team over the past three years. 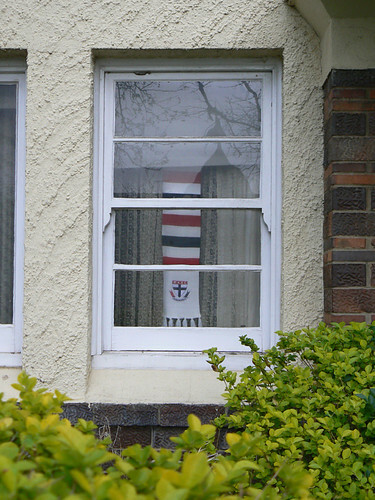 For St Kilda - heaven can wait. 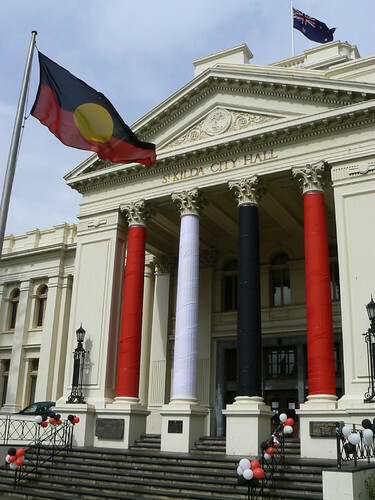 No prizes for picking St Kilda Town Hall as a fairly substantial Victorian building but ... well it's Grand Final week and the Saints are in the Grand Final for the first time since 1997. We've only won it once in 1966. Maybe 2009 will be our year if we can defeat a fantastic Geelong team. 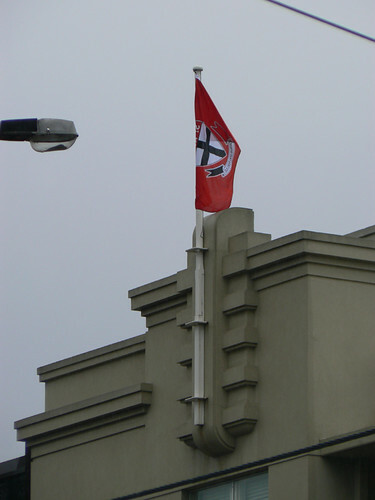 As you can see the City of Port Phillip, which now includes the former City of St Kilda has decorated the Town Hall in the Red, White and Black of the Sainters. 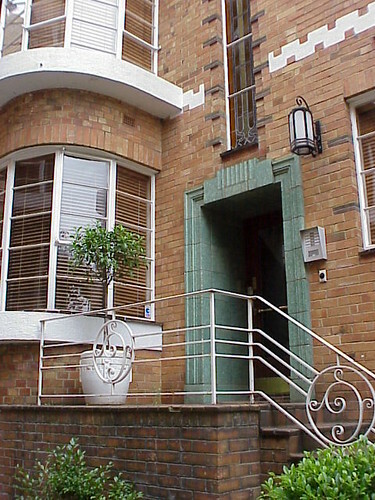 But this is an Art Deco blog, so in that spirit the portico, although not deco was built in 1925 and some deco elements can be seen in the glasswork of the doors. 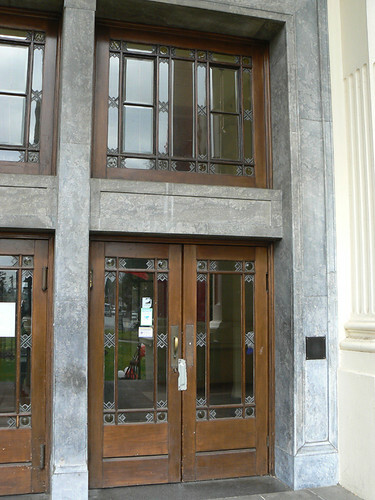 In 1939 further alterations were made to the Town Hall and some interior features have an Art Deco feel. 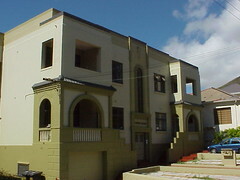 In the 1990s a fire badly damaged the building but was quickly restored with a remodelled auditorium. The Town Hall has been extended and reworked in recent years providing among other things gallery space and better staff facilities. I went to the Royal Melbourne Show yesterday for the first time in yonks. I remember the first time I went was Grand Final day 1975 with my parents. It was our first year in Australia and we choose the Show over the footy. I've never made that mistake again. The Show was good fun and in a first for me I watched the dog judging because friends of mine were showing their Briards and they all won prizes. 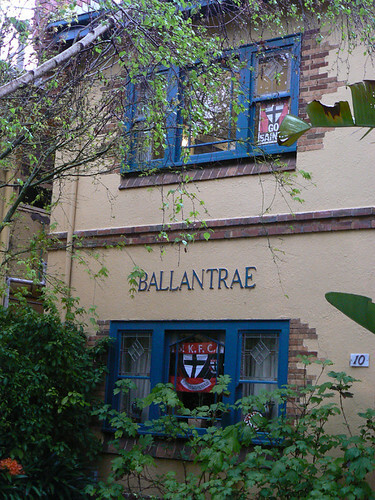 Next door to the Dog Pavilion is Centenary Hall. 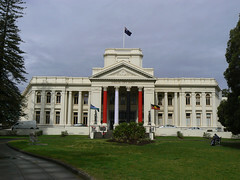 It was opened during the 1934 Show to commemorate the Centenary of Victoria that year. 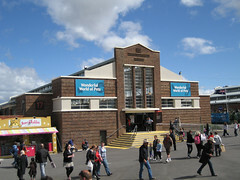 In 2005, the State Government restored Centenary Hall as part of a wider redevelopment of the Showgrounds. 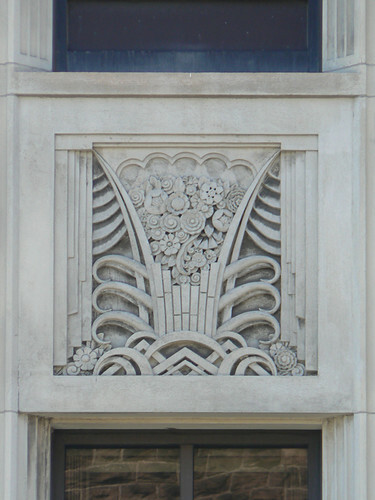 The Hildebrandt Building in Napier was designed by local architect Louis Hay. 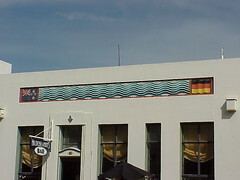 The building itself is very plain but it has a panel with a wonderful wave motif along the facade and the New Zealand and German flags at either end. 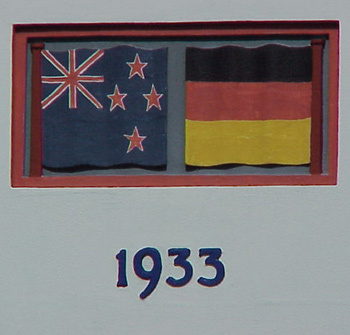 The flags are repeated side by side on the corner of the building above door along with 1933, the date of construction. 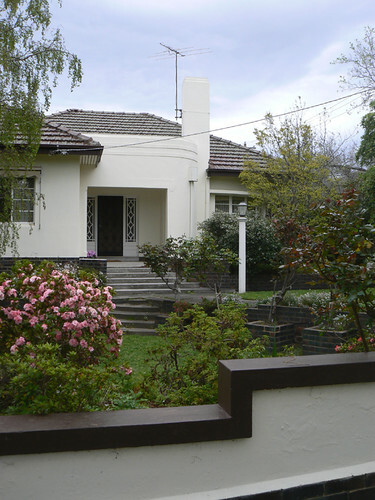 As the name suggests, the Golf Links Estate in Camberwell was built on a former golf course and is considered one of the best interwar suburbs in Melbourne. 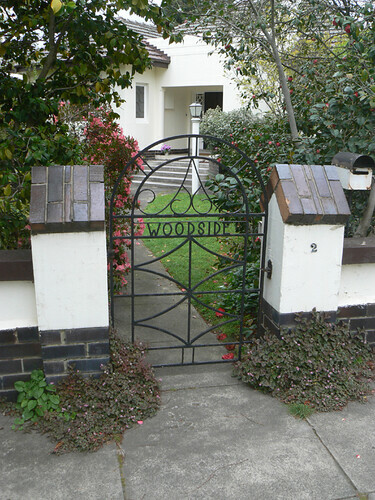 This is Woodside with its name worked into the ironwork of the gate. A concrete path leads past a garden light to the front door, well protected by a substantial porch. 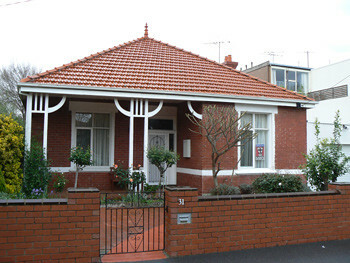 The front garden is surrounded by a short cream coloured wall supported on a base of dark bricks and capped with a strip of brown. 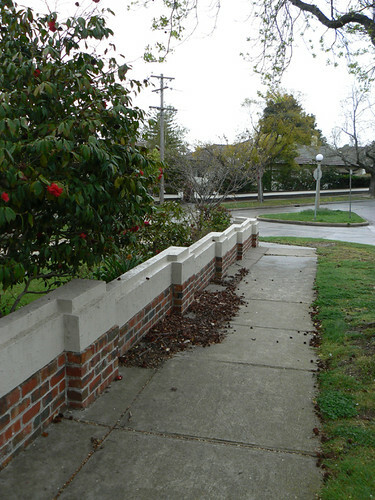 The step-down of the wall mirroring the split level of the enclosed garden. 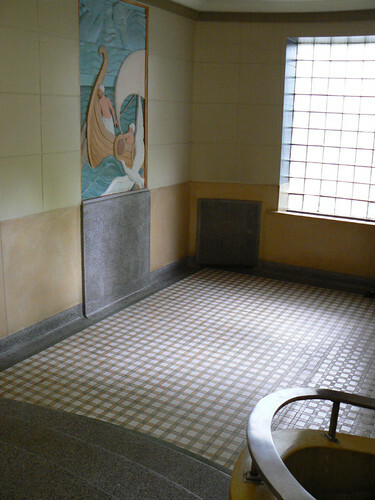 I don't know if it is a particular Art Deco fascination or not but on every Art Deco tour we like to check out the bathrooms and toilets. From the fabulous rest room at Radio City Music Hall in NYC to the most humble house the bathroom is often a treasure trove of deco features. 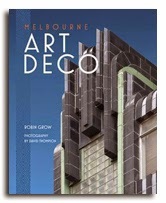 As Robin Grow, noted author and President of the Art Deco and Modernist Society would say in his best Aussie slang, 'we love a good deco dunny'. 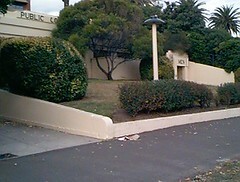 These Public Conveniences are cut in the the garden embankment between Jacka Boulevard and Upper Esplanade in the Melbourne seaside suburb of St Kilda. 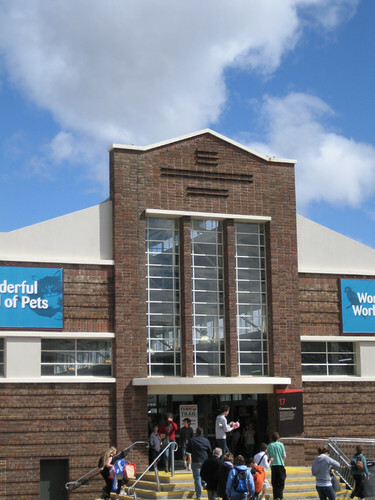 I doubt they are a 'treasure trove of deco' inside but the streamline lines and mushroom light provide a wonderful exterior. 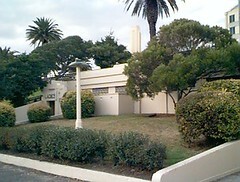 Although there is no overt signage identifying the Public Toilets on Upper Esplanade, they are marked by a pair of fabulous Art Deco pillars. 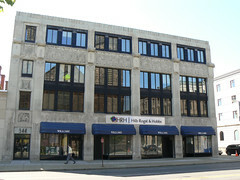 The Vars Building on Delaware Avenue in Buffalo, NY is a wonderfully decorated commercial building. 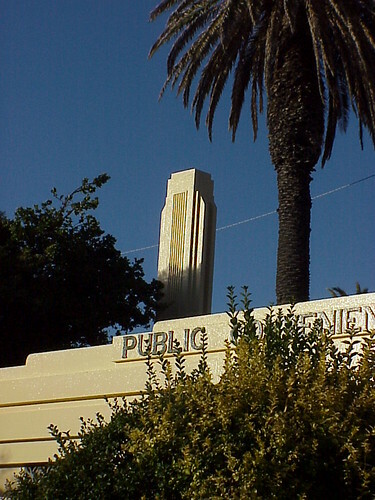 Dating from 1929 it was designed by Lawrence Bley and Duane Lyman the same architects who worked on the magnificent Niagara Mohawk Power Corporation Building in Syracuse, NY. 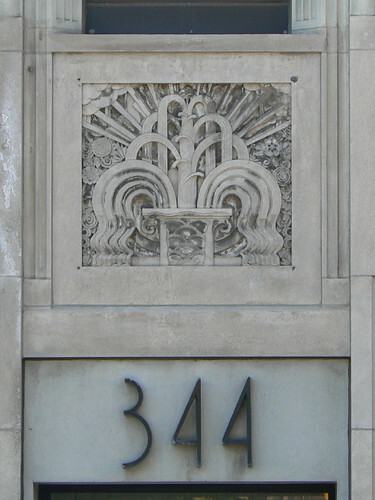 While the Niagara Mowhawk Power Corporation Building is black and chrome with the spectacular 'Spirit of Light' figure on the facade, the Vars Building relies on carved relief panels for decoration. 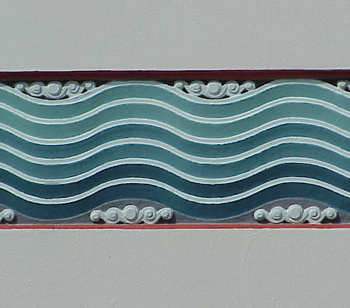 Many recognisable Art Deco motifs are represented on the Vars Building. A frozen fountain with stylised sun rays and clouds sits in a panel above the doorway. 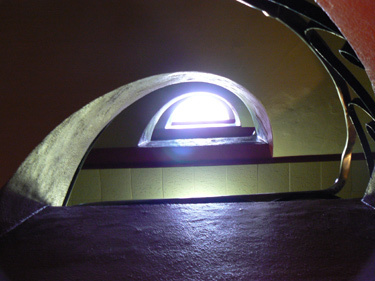 The spandrels on the upper floors feature chevrons, triangles and other stepped forms. 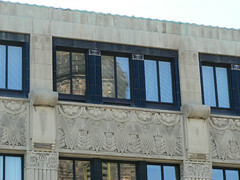 Stylised floral designs decorated the tops of the columns separating the black framed windows. 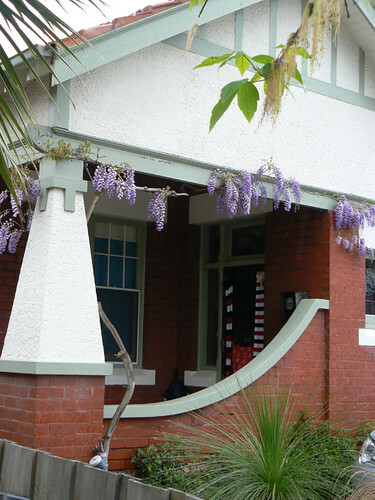 Look at the delicately scolloped roofline and the panel on the second storey above the door which depicts a vase or perhaps a stylised cornucopia bearing a wide variety of flowers. 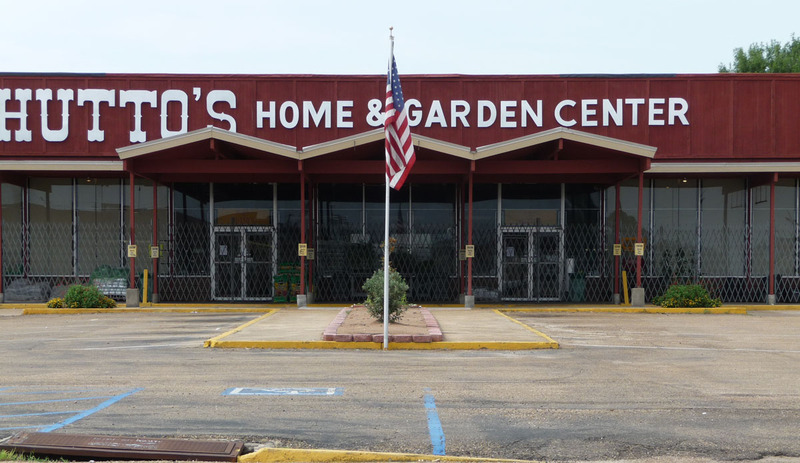 The closer you look at the Vars Building, the more there is to see. I love the names that crop up on Art Deco buildings. 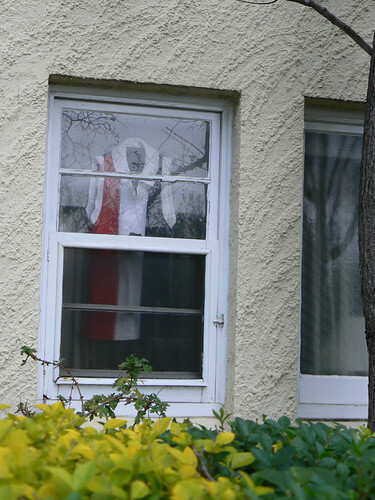 Claradave Mansions, you can only wonder who Clara and Dave are. 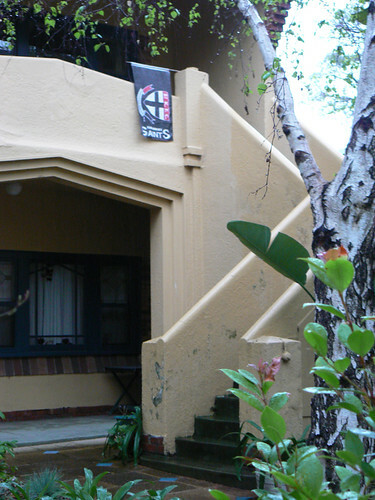 Claradave Mansions are in Vredehoek, nestled below Table Mountain overlooking the downtown area of Cape Town. The name above the door includes the year 1934 and it would be interesting to know whether the garage built into the nearside of the building dates from that time. The arrangement of the twin staircases hidden behind stepped walls leading from the main central entrance is very attractive. 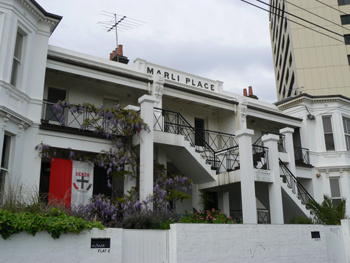 Park Towers is an impressive block of flats in South Yarra. 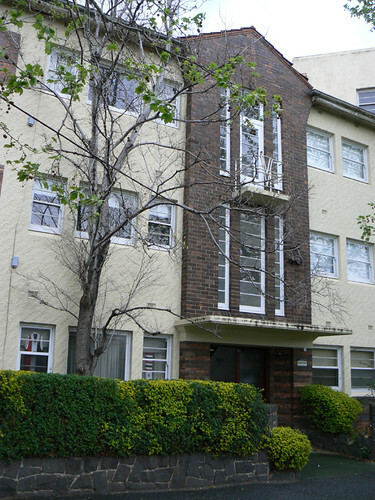 Designed by Arthur W Plaisted, the flats were constructed in 1938. 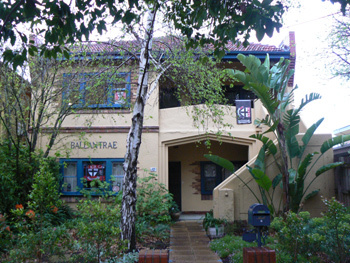 They consist of two blocks facing each other forming a central courtyard which is open to the street. 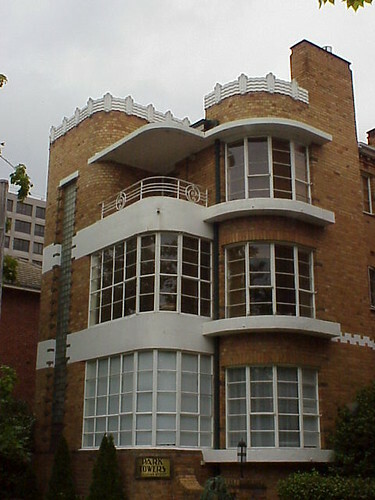 The main features of the blocks are the curved windows and balconies (some of which have been enclosed), the metalwork on the ballustrades and the decorative elements around the roofline. There is a 'chequerboard-like' pattern on the blocks at the ceiling level of the first floor and the entrance to each block is decorated with stunning green tiles. 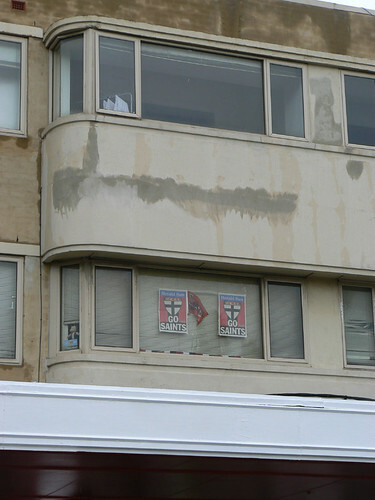 I snapped this modernit building in Worthing and I know nothing about it. 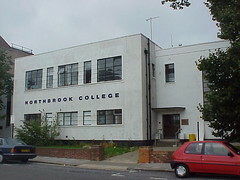 It is clearly named Northbrook College, but their website doesn't show it as one of their campus buildings. Update: @artistsmakers on Twitter has let me know that this buildng was recently demolished after the college sold it to developers. 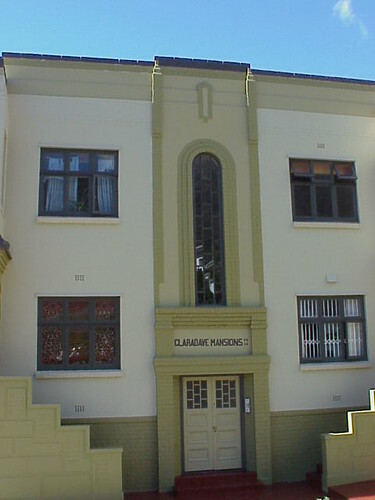 It was an Art Moderne frontage added to a Victorian art college.